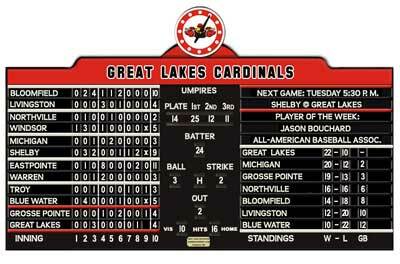 Baseball Scoreboards (Customized, Vintage-style, Wooden, Hand-operated) - Premier Baseball Merchandise – Hands-on Fun For The Passionate Baseball Fan! Loaded with value! Includes approximately 300 numerical tiles! 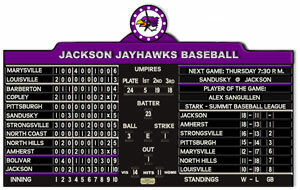 Keep score of all the action, including conference standings (comes with 24 tiles customized with the team names in your conference)! You'll also get all 30 MLB city team tiles for keeping score of MLB games! Comes with a durable, portable container for storing tiles conveniently and a handsome inscribed nameplate customized with your choice of wording! Ideal for any level of baseball competition - youth baseball leagues (Little League, PONY League, Dixie Baseball, Ripken Baseball, Tee Ball, Babe Ruth League, Dizzy Dean Baseball, Khoury Leagues), other amateur baseball (American Legion, high school, college), recreational baseball (intramural, club, adult leagues, Town Team Baseball), Wiffleball, international, professional, semipro, minor league, independent league, fantasy leagues and more! The ultimate Birthday, Christmas, Hanukkah, Valentine’s Day, Wedding Anniversary, Retirement, Father’s Day, Mother’s Day, Bar/Bat Mitzvah or Graduation gift for the passionate baseball fan, player or coach in your life! The perfect décor for bars, restaurants, sports bars, sports card/memorabilia shops and sporting goods stores with a baseball fan clientele! Be creative! Keep score of NFL, NBA and NHL action in the off-season!